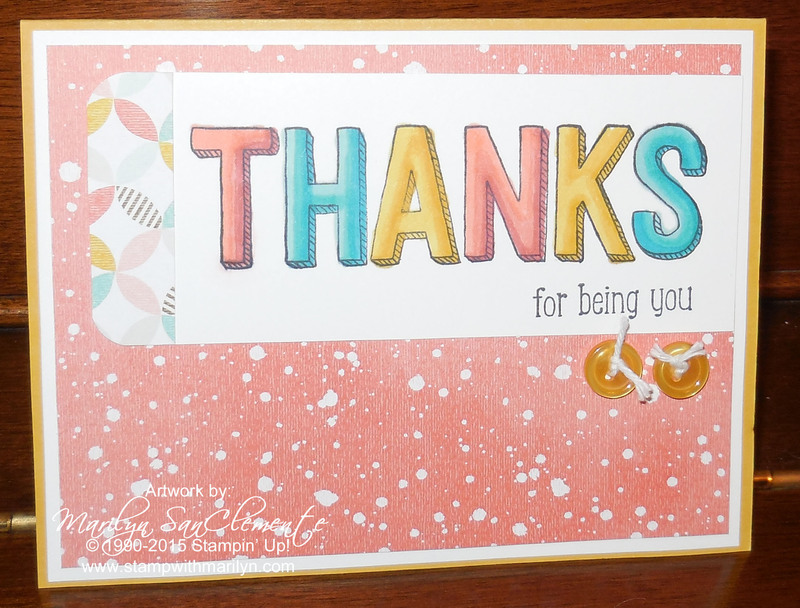 Today I have a quick and easy Thank you card made with one of the new Sale-a-bration sets – For Being You That’s right – there are 4 new Sale-a-bration items that were added to the party for the month of March!! Cardstock: Hello Honey, Whisper white and the Best Year Ever Designer Series Paper from the Sale-a-bration catalog. The THANKS image is stamped with Momento Tuxedo Black ink on whisper white cardstock. I used the Blendablities markers to color in the image and added a small scrap of the Best Year Ever DSP to the edge of the white piece and rounded the corners with a corner rounder punch. To finish off this quick and easy card, I used two buttons from the SAB Accessories pack with a piece of white bakers twine threaded thru the button holes. That’s it!! Quick and Easy!! You can check out the Sale-a-bration items HERE. Ready to place an order? Click HERE and use the Hostess code ZPCMU2AZ and receive a special gift from me.. I love to share the Hostess benefits with my customers. Of course, if your order is over $150 collect the hostess benefits for yourself! Also – don’t forget to choose a Sale-a-bration item for orders over $50!